Four Oaks, a tiny hamlet (2007 Population Estimate: 1,818) within Johnston County, NC, sits on the boundary between that state’s disadvantaged coastal plain and more prosperous Piedmont midsection. Located within the long-challenged I-95 corridor, Four Oaks has struggled for years with a declining agricultural sector and minimal economic opportunity. Most recently, a collapse in residential and commercial construction activity in the adjacent Raleigh-Durham/Chapel Hill region eliminated the jobs to which many Four Oaks residents had commuted, dramatically worsening the town’s already high rates of unemployment and underemployment. Realizing the need to sponsor something catalytic to reverse Four Oaks’ fortunes, the town’s government decided to establish the 365-acre Four Oaks Business Park, securing $2.4 million in public funding to install basic infrastructure and hiring the respected Keith Corporation of Charlotte, NC as master developer for the park. Keith secured a preliminary commitment from leading medical technologist BD, a Fortune 500 firm based in Franklin Lakes, NJ, to construct a state-of-the-art, LEED Gold-certified 720,000 square-foot medical supply distribution center as a high-profile anchor tenant. Crescent Growth Capital enabled the financing for this crucial economic development project by structuring and closing a $15 million New Markets Tax Credit qualified equity investment. 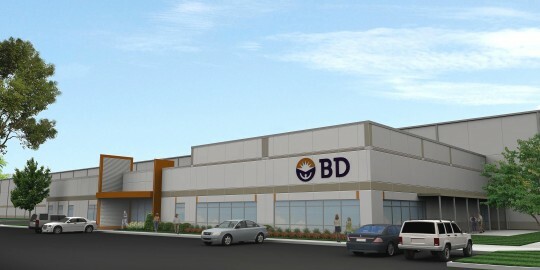 The BD distribution facility, now under construction, will be only the third of its kind in the nation, bringing 200 new jobs to the region and likely spurring, it is estimated, the creation of another 3,000 jobs to be employed by additional tenants attracted to a business park anchored by so reputable a tenant.